The BEST and Oldest hostel in Miami has just moved locations! We knew our guest deserved better so we moved our world famous parties, awesome customer service, and everything you love about us to a new remodeled property with a better location, amenities, and security. If you loved us before, wait until you try us now! Celebrating our 18th Year Anniversary with a brand new place! After much work and effort we tailor made a new place that suits everything that a traveler needs. We still offer the BEST VALUE, The CLEANEST, The MOST FUN and SOCIAL, and the BEST LOCATION of All Hostels In South Beach Miami. We are Located On 10th Street and Collins Ave, Right In The Middle Of The Art Deco District, Just Steps From One Of The World's Most Famous Beach And The Hottest Nightlife, Restaurants, Pubs, Clubs And Shops. We made sure to have all the room types necessary to suit all different styles of guest looking to take advantage of everything our hostel has to offer. We provide 4, 8, & 10 bed dormitory rooms. All of them in either mixed or female only style. All of our dormitories include; premium 10 inch single coil mattresses, private bathrooms, outlet and reading light by the bed, a big locker, a safe, hair dryer, iron, ironing board, Wi-Fi, and Air-conditioning. Superior 2 double bed private room- These rooms fit up to 4 people and they are perfect for those guest looking for privacy while still enjoying all of the social aspects of our hostel. Equipped with premium mattresses, private bathroom, Wi-Fi, linen & towels, safe, cable TV, and air con. Superior 1 Double bed Private room- These rooms fit up to 2 people and they are perfect for those guest looking for privacy while still enjoying all of the social aspects of our hostel. Equipped with premium mattresses, private bathroom, Wi-Fi, linen & towels, safe, cable TV, air conditioner, and a Mini-fridge. Scuba Diving, Fishing And Many Others..
Miami Beach International Hostel Policies, rules, and important information. -Dinner is served at 6:00 PM. -Free shuttle from MIA airport pick-up times are; 9:00 AM, 12:00 PM, 3:30 PM, and 6:30 PM. 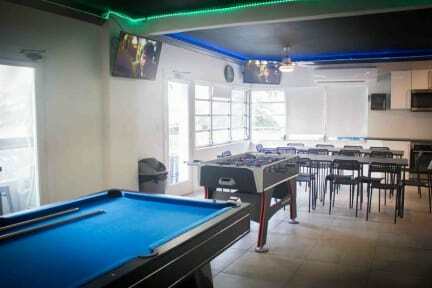 -Miami Beach international hostel is a traveler’s only hostel. All guest may be requested to show proof of onward travel in order to check-in. No Miami residents allow. -All guest checking into the hostel must be over the age of 18. Methods of payments available upon arrival: Cash, traveler’s check, credit cards, debit cards. Please be aware that there is a 3% charge for all credit card payments. 14% tax is not included. $2 nightly resort fee per each shared room bed. Meeeelhor custo-benefício. Sem dúvida voltarei! It was my second time there, and i pretend to come back soon. If you want to party so, this is the right place. Foi minha primeira vez viajando sozinha. Gostei do ambiente e conheci muita gente. As instalações são um pouco antigas. A localização é ótima, fiz tudo a pé ali por South Beach. As camas são confortáveis, não barulhentas, com tomada, luz e prateleira. A roupa de cama vc pega quando faz o checkin e entrega no chechout, eles te cobram 10 dólares na entrada por garantia da devolução. O café é simples e o jantar não é tão bom. Tem um bar na entrada em legal. Bom custo beneficio. Recomendo. Ótima opção para Miami. Foram bons dias no hostel. Maiores armários que já vi, chave numa pulseira impermeável, café da manhã e jantar simples incluídos na diária, toalhas a 1 dólar, a uma quadra da praia... Só lamento que as mesas de bilhar e pebolim estivessem empenadas, e que não haja espaço na pia para apoiar coisas. It is a great place and best location, I will be back!!!! The place where the hostel os situated is awesome. One block from the Beach, walking distance to most of the places in South Beach. The rooms were confortable and the kitchen and living room were great. The only problem I had was with the staff no being Nice and the wifi just not working at all in some áreas of the hostel. How can you not offer decent wifi on a hostel in 2019? 1) I booked a room for 04 people. On confirmation of booking, it was described : "Superior 04 bed private ensuite". I waited for 04 beds and the bathroom but the attendant told me that “private rooms” means 02 double beds 2) problems in the bathroom in 02 nights. 3) problems in the trip bought in the hostel. Delays and bad conditions.